Dollar jumps higher in early US session as supported by strong retail sales data. But the greenback is once again outshone by Yen on risk aversion. At the time of writing, DAX is down -1.22%, CAC is down -1.19% and FTSE is down -1.17%. Earlier in Asia, Nikkei lost -0.68%, HK HSI dropped -1.55%, Shanghai SSE declined -2.08%. But Turkish Lira is not the one to blame today as USD/TRY has indeed dipped further and breached 6.0 handle. Instead, poor earnings results of Tencent, selloff in Copper and Zinc which hit one year low are among the factors. And more importantly, we see selloff in Chinese Yuan, with USD/CNH hitting as high as 6.934 as a major reason. Meanwhile, Gold is accelerating downward after taking out 1200 earlier this week, hitting as low as 1183.93 so far. WTI crude oil is under renewed pressure and is back at 66.3, and that’s a reason for Canadian Dollar’s weakness too. Technically, though, EUR/JPY, GBP/JPY and AUD/JPY are still holding above Monday’s low at 125.13, 140.23 and 79.97 respectively. Thus, they’re still considered as in consolidation. But these levels will for sure be watched. EUR/USD, GBP/USD and AUD/USD are staying in healthy decline and starts to pick up some momentum ahead. 0.9984 resistance in USD/CHF is the level to watch for the session too. US headline retail sales rose strongly by 0.5% in July, much higher than expectation of 0.41% mom. Ex-auto sales rose 0.6%, also beat expectation of 0.4%. Empire State manufacturing index rose to 25.6 in August, up from 22.6 and beat expectation of 20.3. Non-farm productivity rose 2.9% in Q2, above expectation of 2.5%. But industrial production rose only 0.1% mom in July, missed expectation of 0.3% mom. UK headline CPI rose to 2.5% yoy in July , up from 2.4% yoy and met expectation. Core CPI was unchanged at 1.9% yoy, met expectation. RPI, however, slowed notably to 3.2% yoy, down from 3.4% yoy and missed expectation of 3.6% yoy. PPI input rose to 10.9% yoy, up from 10.3% yoy, above expectation of 10.8% yoy. PPI output slowed to 3.1% yoy, down from 3.3% yoy and missed expectation of 3.2% yoy. PPI output core dropped to 2.2% yoy, down from 2.4% yoy, missed expectation of 2.2% yoy. House price index slowed to 3.0% yoy in June, slowed from 3.5% yoy, above expectation of 2.8% yoy. The rise is headline CPI is in line with BoE’s own projection today. In the August Inflation Report, the bank projected CPI to climb to 2.5% in Q3 this year. The question is whether inflation will then slow from there. BoE expects CPI to slow to 2.2% in Q3 2019. The National Institute for Economic and Social Research pointed out that stripping out extreme price moves, CPI has indeed dropped in July. The trend reversal will likely emerge ahead. SNB Vice Chairman Fritz Zurbruegg said in an even in Zurich that recent developments have shown that “the currency markets remain fragile”. And that could lead to “safe have flows in the Swiss Franc”. And that means, the central bank’s current ultra loose monetary policy with negative interest rate is justified. And SNB stands ready to intervene when necessary. Some analysts tipped 1.2 as a level where SNB would start being active in intervention. Turkish Lira rebounds further despite trade spat with US. Turkey’s clashes with the US has turned into trade war. The country doubled tariffs on some US imports including alcohol, cars and tobacco, in response to US doubling of steel and aluminum tariffs. Vice President Fuat Oktay tweeted that the moves are for US “deliberate attacks on our economy.” However, relations with EU seemed to have improved after a Turkish court released two Greek soldiers pending trial. Additionally, the CBRT is squeezing liquidity as observed by bankers, which helped pushed interest rates higher. USD/TRY dropped to as low as 5.9180 earlier today and stays soft. Australia Westpac Melbourne Institute consumer sentiment dropped -2.3% to 103.6 in August, down from 106.1. The index pared back half of the “surprisingly strong gains in June to Jule” as the impact of government’s tax cuts faded. The decline also came against the backdrop of rising global trade tension and housing markets correction in Sydney and Melbourne. Westpac pointed out RBA’s projection that inflation will hit 2.25% by 2020 and expects next move is up. It noted an “obvious headwind” for RBA is “the impact that five years of underperformance in inflation will have on households’ and firms’ expectations.” And, “lower expectations will make it that much more difficult to lift inflation back into the band”. Westpac also noted that “certainly it will be quite some time before the Bank has a case to adjust the cash rate.” And it maintains the view that RBA will be on whole in both 2018 and 2019. Also from Australia, Wage price index rose 0.6% qoq, 2.1% yoy in Q2, in line with expectation. Private sector wage price grew 0.5% qoq, 2.0% yoy. Public sector wage grew 0.6% qoq, 2.4% yoy. Daily Pivots: (S1) 1.1306; (P) 1.1367 (R1) 1.1404; More….. 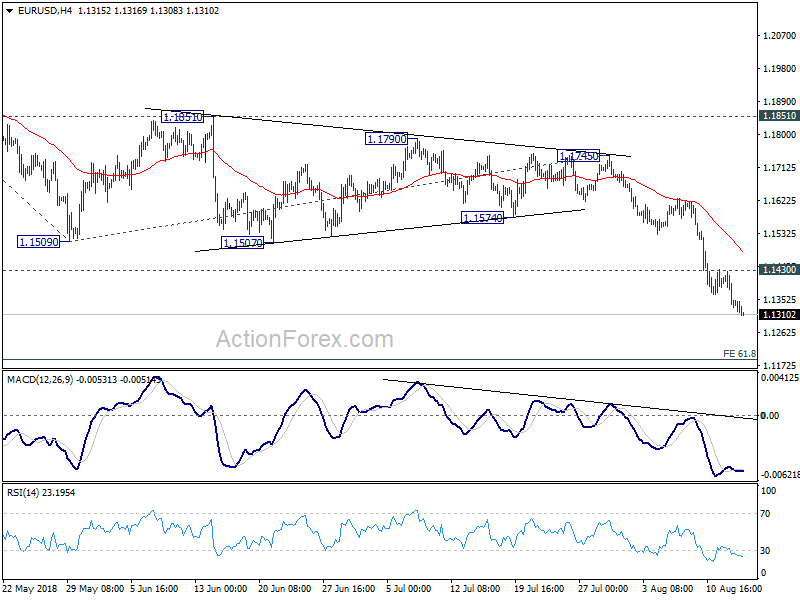 Intraday bias in EUR/USD remains on the downside as down trend continues. Next target is 61.8% projection of 1.2413 to 1.1509 from 1.1745 at 1.1186. Note that it’s a cluster level with 61.8% retracement of 1.0339 to 1.2555 at 1.1186. Hence, we’ll tentatively look for short term bottoming around 1.1186. On the upside, above 1.1430 minor resistance will turn intraday bias neutral and bring consolidations again. 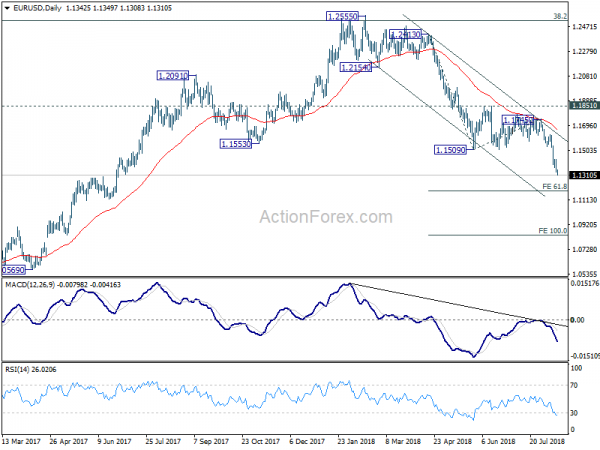 In the bigger picture, the down trend from 1.2555 medium term is in progress for 61.8% retracement of 1.0339 to 1.2555 at 1.1186. Note again that EUR/USD was rejected by 38.2% retracement of 1.6039 (2008 high) to 1.0339 (2017 low) at 1.2516. That carries some long term bearish implications. Sustained break of 1.1186 could pave the way back to retest 1.0339 low. For now, outlook will remain bearish as long as 1.1851 resistance holds, even in case of strong rebound.